Tis the season of commencement! Throughout the months of May and June several mobs of high school and college students graduate and after years of hard work, they deserve something extra special. We all know how easy it is to hand over an envelope with a wad of cash and call it a day, but if you want to make their transition into adult life as smooth as butter – you should get them something they need and will benefit from on the daily. Whether they are about to jet set off for a gap year or are heading straight into the workforce, they need some luxury staples for their exciting new life. That said, mark their achievement and welcome them to the real world with these 4 grad gifts they will be able to use forever. First impressions are everything and if you want your grad to rock their future interviewer’s socks off – they are going to need to dress the part. A quality leather padfolio says a lot about wits and it’s not something your grad might think they need until it’s the night before their first interview. This padfolio will help your grad be professionally prepared while looking swift at all times. Get the Royce Leather Executive Zip Around Padfolio ($131.19). It’s a lightweight, pro-level organizer that is 100% practical for work, travel and, yes, play for the future, too. Real talk: Has anyone ever gone wrong when gifting or receiving a classic genuine Italian leather belt? I think not. A leather belt is a timeless staple and will be an item your grad will have in their closet for years and years to come. The Royce Leather Airport Security Checkpoint Friendly ($56) has a detachable chrome buckle which makes it incredibly easy to remove when going through airport security….and side note, a gentleman should never leave the house without a belt. Back in the day (and maybe still today), the go-to grad present norm, especially for men, was a classic watch. While watches do make an excellent gift choice change it up a bit and get them something more clever and equally beneficial like a watch organizer! The Royce Leather Watch Cufflink Box ($79.99) is a brilliant solution for their most sumptuous accessory pieces to stay all in one place and not lost in translation or stuck between their car seats. This organizer holds cufflinks, watches, and jewelry alike. Take your wallet game to the next level with a wallet that carries cards, a passport AND has RFID blocking technology. If you ask me, a wallet like that is classic no-brainer grad gift perfect for entry into adult life. P.S. For those who don’t know what the heck RFID (Radio Frequency Identification Data) is, it’s a blocking technology designed to secure your private information even remotely. Are they about to jetset off for a much-deserved gap year? Here’s five gifts your grad needs before they set sail! It’s Memorial Day weekend – which means you have 3 days off to do anything and everything you want…or nothing at all. We are raising our flags, firing up the grill, stuffing our picnic baskets, grabbing our camping gear, paying our respects to those who served, and of course, participating in meaningful acts of patriotism. Below are 7 different ways you and your friends can delight in Memorial Day! A random but relevant story: My childhood home sat on four acres of grassy lush fields and ended with a flowing river and a mini graveyard on the property. Every year on Memorial Day a little old lady would bring flowers to the grave of her fallen hero. It was a sweet, innocent and beautiful tribute to a fallen hero. Apparently, he was a Revolutionary War soldier, her great uncle, and in her mind, a legend. That said, you should consider doing the same! Head to a memorial, decorate a grave with flowers, lay wreaths for the fallen or merely pay a visit to a loved one. They would love to see you! Winter is over and it’s “safe” to plant gardens to your desire! This long weekend is the perfect time to get out in the yard and start primping and pruning for the warm, summer months ahead. To honor the holiday, plant a garden of Poppies! Poppies are the official flower of remembrance and a signal of respect on Memorial Day. They represent both gratitude and hope for Veterans, and once bloomed, will add a beautiful pop of color to the world! Gettysburg National Military Park – site of the bloodiest battle in the civil war, which later provided inspiration for Abraham Lincoln’s Gettysburg Address. Vietnam Veterans Memorial – honor’s lives lost during this controversial war and is seated in our nation’s capital. Minute Man National Historical Park – the opening battle of the American Revolution took place at this site. World War II Valor in the Pacific National Monument – the location of the American battleship force during the Pearl Harbor attack. Virtually every town in the Nation will be having some kind of parade party this weekend, and a parade is a prime opportunity for some solid people watching and all-day entertainment! So, grab your crew cooler and head down to your local parade early to get a good spot. Most veteran service agencies plan the parades, so check their websites for parade routes or go here for a listing of parades across the nation. We aren’t joking. A law was passed by Congress in 2000 requiring Americans to pause at 3:00 pm local time on Memorial Day to honor the fallen. This isn’t enforced or observed regularly, but we suggest setting an alarm on your phone and taking a moment in silence (yes, set the hot dog down) to be thankful for your freedom! If you’re looking for a way to truly give back, we suggest taking one day this weekend to volunteer. It could be anywhere, but the local VA hospital is our top pick. Older vets oftentimes are just seeking out company and someone to listen. You may get lucky and learn first-hand what it was like to serve in WWII or any of the other wars. The population of men and women who served in these wars is decreasing, so do a great deed and be exposed to a piece of history this Memorial Day weekend. Donate the belongings that you can stand to live without and make room for your summer essentials! I’m sure it wouldn’t kill you to do a little spring cleaning. So get downsizing and start minimizing. Giving always feels good, and you get a tax deduction! This week we are celebrating our amazing Customer Care Success Team….wait, wait wait. Let’s back up a second. Did you catch that? We changed our name from Customer Care to Customer Success, and here’s why! It’s simple. This team understands that customer support is a team sport. They are committed to working together to ensure that every single customer achieves success in every interaction they have with eBags. It starts with listening. Our Customer Success team understands how important it is to fully understand a customer’s needs and it starts with asking questions, listening to the customer, and being empathetic in every situation. It continues with solving problems. Our Customer Success team knows our product and knows how to find solutions. They aren’t afraid to get creative and to work with the customer to come up with out-of-the-box solutions to solve problems quickly and painlessly. Because we are so proud of our Customer Success Team here at eBags, we decided to show our appreciation for the team by throwing them a Customer Success Spirit Week. Connie, our Customer Success’ Fearless Leader! Every day our group of serial successors has been sprinkled with a little something special to assist in their never-ending quest to create a successful experience for every customer. Here’s a glimpse for how we celebrated our teams’ awesomeness! Monday – Bagels and Coffee. A breakfast combo that will never go out of style. Wednesday – Caricaturist. You know, the artist who draws silly photos that look eerily like you? We had a fun time with this activity! Thursday – Blog launch and “Thanks a Latte’s” at their desks! We want to give special thanks to our loyal fans for helping us achieve such a great success! Have you had any amazing, potentially life-changing Customer Success stories with eBags? Share you experience in the comments below! Memorial Day is just around the corner. Whether you’re celebrating on a family camping trip or heading to the lake with your closest friends, we’ve rounded up some essentials you’ll need to toss in the bag for your weekend getaway ahead. 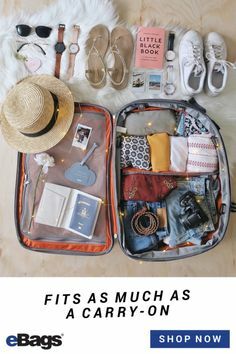 This spring, outdoor activities are the rule and splurging on some new travel gear to kick off the summer fun is a necessary part of the changing seasons! Plus, if you stock up now you can save 20% off on Summer Vacation Essentials so you can make this a memorable Memorial Day and an epic season thereafter. Without further ado, let the countdown begin, the warm weather soak in, and the introduction of summer fuel your journeys! We recommend booking your campsite 6 months ago and picking up a tent that is waterproof NOW! Unless you plan ahead, spring showers mean wet campers and no one wants to be a wet Sally. The Kelty Salida 4 Person Tent ($249.95) is comfy for two or perfect for a small family. If you plan on going car camping this year (who doesn’t), you might as well invest in a brilliant car organization solution. Whether it’s for your groceries, your car kit, or merely to keep your camping items nice and neat, meet our personal fav, the trunk organizer ($19.99). Before you begin your summer adventures this Memorial Day, take a little bit of time to do some “spring cleaning” and get your car in order. You will be so happy you did it. For those of us who still appreciate a little comfort in the great outdoors, glamping (short for glamorous camping) is the best way to go camping these days. Ultimately, just because you left home and are exploring doesn’t mean you can’t have a little luxury. Besides, when you glamp properly – you can expect your wilderness street cred to go up a few notches. You’ll never need to find another excuse to just “hang out” at the campsite after you make this smart buy! The Honey Baked Hammock ($59.95) for you and your honey! If you are glamping with your loved one, it only makes sense to snuggle up in something large enough for two! Try the Doublewide Sleeping Bag by Big Agnes ($239.95). Memorial Day is generally the first weekend out on the boat and you don’t want to forget the essential boat staple…the cooler. The Crew Coller II ($49.99) is the perfect size for a nice day out with ample storage space for ice so your food and bevs stay cold and your day stays awesome. From business suit to bathing suit, you might be heading for the shore or have softcore plans to sit by the pool this Memorial Day weekend, and all summer for that matter. Either way, we think you need to make a statement this summer. Normal beach bags are so yesterday, but the “I Need a Vacation” Kate Spade Francis tote ($198) is…well, expressive. Spring means cycling season and what better time to get out for a long ride than now! So pull your gear out of the closet or garage and treat yourself to something new and useful. Who says cyclists can’t also be fashion forward? 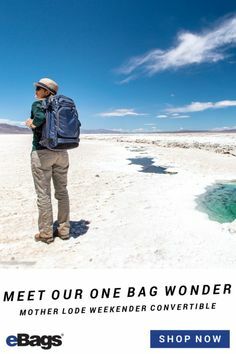 Timbuk2 thinks you can do both and we couldn’t agree more! 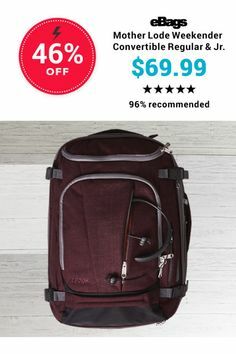 The Especial Tres Backpack ($209) offers serious expansion options for the serious cyclist, as well as cushioned, ventilated straps (yep, no more sweaty pits) and reflective paneling for if you take on a bit more than planned and end up riding home in the dark. Oh, and it’s waterproof. This year marks the centennial celebration for our National Parks. There are 58 of them in the U.S. and it’s their birthday, so we suggest figuring out which park is close to you and start preparing your packing list! What better way to show your patriotism over Memorial Day than to celebrate our most beautiful land in the country. Meanwhile, if you plan on hiking treks at all this season prepare yourself now while it’s 20% off. You’re going to need a day pack and The North Face Jester Pack ($64.90) has your back! No matter how you spend this holiday don’t forget the entire reason you are celebrating in the first place. In honor of the men and woman who serve our country and allow us to be free. How will you be spending Memorial Day? Leave a comment and we’ll share one inspiring story with all our fans on Facebook! Deciding whether or not to take a year off instead of going straight into a job seems to be the question of the hour for recent grads. Following graduation, the journey a grad embarks on will serve as the roadmap for how their future life will unfold, so it’s critical to make the journey one that will have lasting life benefits. No, we aren’t going to tell your grad to go straight into the workforce or continue getting their education. In fact, we are going to make the argument to do exactly the opposite: take a gap year to travel and explore the world, but do it in a way that sets you up for future success. “Gap year,” or taking a year to travel, should never be used as an excuse to take time off and “find yourself”. Rather, it can be a beneficial opportunity to gain work and life experiences in a global setting. That’s the beauty of travel: grads can accomplish the same things abroad that they would at home (i.e. an internship, further studies, volunteerism or working an entry level job), but what’s better, they will be broadening their horizons and learning more by doing them on a global scale. Plus, traveling is one of the best things that one can do for their health. Gap years should not be viewed as a year off but rather a year on. Need not forget, the purpose of this journey is to learn more, see more of the world AND get prepared professionally and emotionally to take on further educational challenges and/or get a job. It’s important to factor in potential areas of interest, career-wise, before making an official decision. Ask yourself: What are my goals in life? If you don’t know what you want to be when you grow up, that’s okay. When planning your gap year, consider the things you’re passionate about. For example, if you want to be a vet, you should try to do something that will lend you some experience with animals. Or have you been considering becoming a doctor? Try a program like Doctors Without Borders to see if it’s something you’d really be interested in pursuing. Traveling alone to an unfamiliar place can be scary! You never know what might happen, and as Murphy’s Law shall have it, what can happen will happen. Stay safe and cover all the bases with travelers insurance. We use World Nomads Travel Insurance. 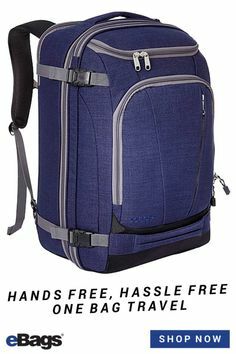 It’s super easy to use and is designed to cover everything an independent traveler might need while on-the-go. Choosing the right luggage and gear could make or break the journey. Generally speaking, packing lite is always recommended, even if you are going to be gone for six months or more. Remember, people do live in these far-off places, and they sell goods and services. It is usually easy to buy clothes, supplies, and services, and in many places, they will be cheaper than at home! If you plan on trekking by foot the majority of the time, you’re not going to want to have to wheel around a suitcase. 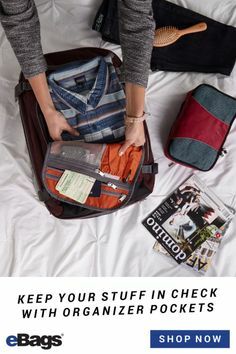 Besides, a well-designed, comfortable pack will be easy to manage and in some cases, will allow you to pack more items than a typical suitcase could! We recommend the Mother Lode TLS Convertible. For other packing tips on must-haves for the grad on the go, check out the Top 5 Gifts Your Grad Needs Before They Set Sail. Travel can be addicting. And some people develop careers that keep them overseas or jet-setting all over the world. Grads who set this intention early on and start planning to achieve it will have a far better chance of succeeding with this career path. But there are also grads that get stuck abroad and don’t come back. Not because they’ve built a life and career for themselves elsewhere, but because the “real world” is no longer exciting, interesting, and may even be a bit scary. Grads who get stuck abroad and don’t complete their education or take advantage of the opportunities that are waiting at home post-graduation can waste precious time building the life they want to live. Use the time abroad to awaken the love for learning and open your eyes to worldly experiences. 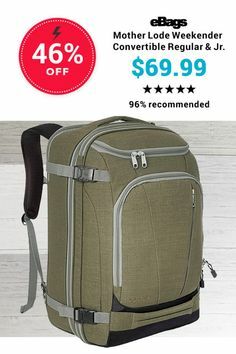 If you are supporting a grad who is trying to make these tough life decisions, please share your thoughts and don’t forget to visit the eBags Graduation Gift Shopping Guide and sale this week! Need a few more reasons to help convince your parents you should take a gap year? Here are 8 reasons why traveling is good for your health! Introducing Anuschka, the premium brand of hand painted accessories available at eBags. Anuschka products range from handbags to wallets to belts…and now summer sandals! Each Anuschka accessory is unique and each accessory tells a creative story. What story do you want to tell? Why you need it: Yes, we all have the simple black summer sandal that goes with every outfit, but you know what else the black sandal goes with? It goes with ‘boring’. It’s time to add some imagination, originality, and color into your sandal collection this summer. Go with Antique Rose Pewter or Luscious Lilies Denim with breathable leather lining for added comfort for the flower lovers out there. You could even try the Jaipur Paisley for the perfectly pink adjustable straps which are sure to look fabulous with any sun dress. For your soles comfort, we must note that Anuschka sandals do tend to run a bit small so please check out sizing specifications! Somebody has to save our skins. Good news, eBags is here to solve your Star Wars travel needs. This is not “a trap”! Why you need it: It is time to expand your collectibles into travel with a Star Wars carry-on spinner that is as strong as THE FORCE. This carry on is sure to fit in a Starship Cruiser overhead of any size and with all of your gear! So go ahead and throw in your Empire shirt, Darth Vador shoes, and even your C-3PO sweatshirt. I guarantee you won’t be confusing your luggage with anyone else’s at the airport…or should I say starport? Buy It. Or don’t buy it. There is no try.